...that the IsoDidact is an imprinted duplicate of the original Didact? 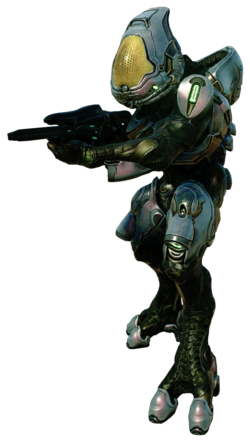 The Ranger harness is an armor harness used by Sangheili Rangers and Ranger Commanders. During the Taming of the Lekgolo, an unidentified Arbiter wore armor based on the contemporary Ranger harness. There are two versions of Ranger harness based on the Assault harness. This version has a transparent EVA faceshield. It also has full mobility in zero- or low-gravity conditions, though can be used in planetside operations. This set is often fielded with an external thruster pack. This armor set is typically white when worn by regular Rangers and gold when worn by Ranger Commanders. The Swords of Sanghelios use a maroon color scheme. 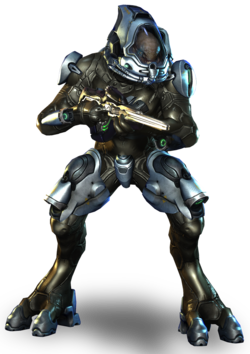 This version does not have an EVA faceshield, but instead has a helmet more similar to that of the Assault harness. 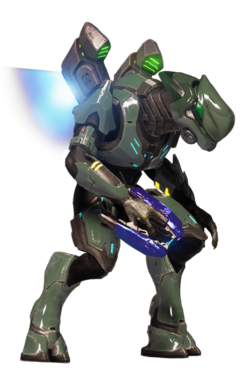 It uses the main body design of the Sangheili combat harness but has two thruster packs on the back. Assault-based Ranger harness with EVA faceshield. Assault-based Ranger harness without EVA faceshield. After spending several centuries creating parts for other Sangheili harnesses, Lodam Armory pooled their efforts and made this variant based on their first fully in-house armor system, the Storm harness. This harness is also marginally heavier than the Storm harness it was based on. This version is a lightly armored and has a mesh suit that is protected by energy shielding. The boots can magnetically latch if necessary. This version also has forelimb and hind limb thrust control to help keep the user from losing control of their body. The thruster packs that this suit uses are gravity-mitigating. 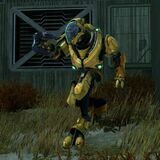 This armor is able to be used in space, radioactive sites, and other hazardous locations. There is also a second version of the suit with more layers. Second version with more layers. 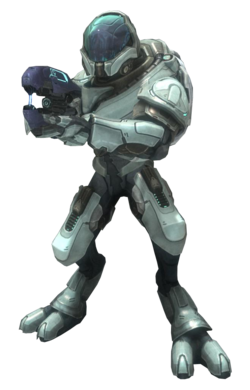 The Assault harness-based Ranger harness with EVA faceshield may be unlocked for use in Halo: Reach by achieving the rank of Sergeant. Old version of the Assault-based Ranger harness used in Halo 2. Ranger Commander Assault-based Ranger harness as seen in Halo: Reach. Kola 'Baoth in an Assault-based Swords of Sanghelios Ranger Armor. Storm-based Ranger harness as seen in Halo 4. Ancient Ranger harness helmet as seen in Halo 2: Anniversary Terminals. Storm-based Ranger harness as seen in Halo 5: Guardians. The Assault-based Ranger harness in Killer Instinct. A red Assault-based Ranger harness in Killer Instinct.